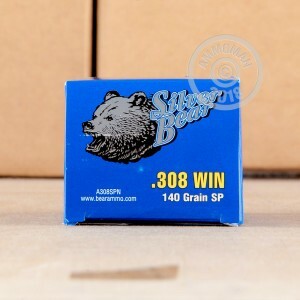 Silver Bear ammo is a smart option for cheap range time. This 308 Winchester ammo come loaded with a 140 soft point bullet, which is a bit lighter that the standard 147 or 150 grain bullet. 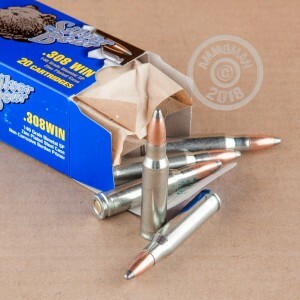 What makes this ammo different from other cheap Russian ammo is that the steel casing are coated with zinc to reduce friction with the chamber and improve cycling performance. 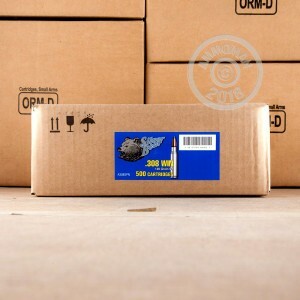 This ammo comes in 20 round boxes and was loaded in the Barnaul Cartridge plant in Russia.